Pure K9 premium optic crystal diamond securely glued onto a jet black crystal tower. Great for sales incentive programs. Available in three sizes. The Nik Meller Collection of elegant premium grade optic crystal Awards are designed by International furniture designer and sculptor Nik Meller. As part of the Nik Meller Golf Award Series the Solstice crystal award highlights bold elegance. 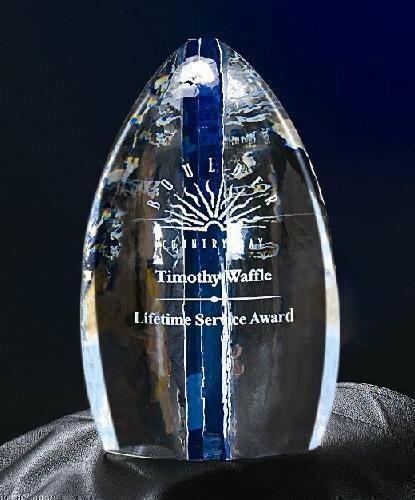 The award is provided in a strong cobalt blue crystal highlighted by the curved face and offset base which addresses refined lines and arcs. The circular face is accentuated at the peak by a half ellipse with a raised carved crystal golf ball residing in the middle. This award boasts esteemed recognition, achievement and praise. Available in three standard sizes. Custom sizes and multiple color combinations available upon request. The Nik Meller Collection of elegant premium grade optic crystal Awards are designed by International furniture designer and sculptor Nik Meller. 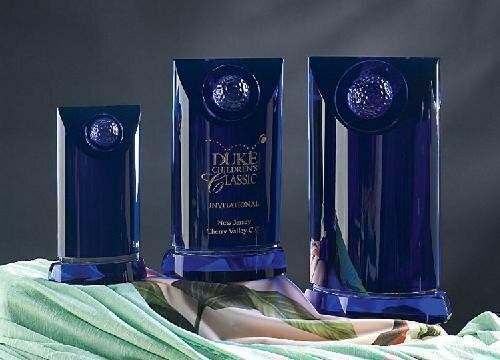 The Soul Mate crystal award encompasses an elegant cobalt blue crystal base with extending sculptural pieces. The front displays a cobalt blue crystal design with an oval etched peak. The background is a tilted rectangular clear crystal panel with accented rising arc highlighting the crest. This award speaks to the recognition of an excellent performance completed. Available in three standard sizes. Custom sizes and multiple color combinations available upon request.